Man arrived on the scene very late in the Mediterraneans history, with traces of Neanderthal Man in the caves at Circeo, just south of Rome, in the Ligurian coast of Italy, in Gibraltar, in France and in some other areas. The arrival of our more direct ancestor, Homo Sapiens, can be traced to around 100,000 years ago. Knowing his propensity for war right up to the present day, one can legitimally suspect that Homo Sapiens Sapiens actually had a hand in the extinction of Neanderthal Man about 30,000 year ago. Each recurring ice-age produced huge drops in the level of the seas, as much water was deposited miles high, in the form of ice in the worlds polar regions. This allowed primitive man to wander ever further and to populate many lands, even those which were later to become islands, with the return of higher sea levels during the warmer ages. For example, Sardinia was populated in this way, some 40,000 years ago, by wandering tribes coming from Tuscany, through Elba into Corsica and across into Sardinia. With the return of a higher sea level, these first Sardinian tribes became stranded there and remained isolated for a very long period, until visitors arrived by boat very much later. Today the Sardinian people represent a uniquely different population from that of the rest of Europe, remaining a relatively "pure" example of the Indo-European tribes wandering around Europe 40,000 years ago. 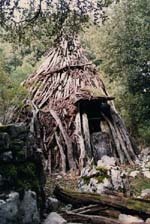 A similar example is the Basque population, isolated in the Pyrinees mountains between Spain and France. Primitive Man was not to be stopped for very long by short stretches of water, as his innate curiosity and thirst for adventure, drove him on rudimentary rafts and boats made of bundles of reeds, to paddle and drift his way across waters, to islands such as Cyprus and Malta 5000 years ago, where they formed the basis of present day populations. Man slowly populated the whole Mediterranean basin and thrived successfully in this favourable and special environment. The Mediterranean now represents the cross-roads of Western Humanity, with layer upon layer of different cultures; for example you will find Roman cities all over the Mediterranean, Greek cities in Sicily, the Arabs in Spain, Islam in Yugoslavia, making a fascinating mixture that will enthral the sailor-tourist on his travels around the Mediterranean.